When taking a taxi from Palma de Mallorca Airport, the approximate fares to drive to popular destinations are displayed on the board, as shown below. Although the end charge is much higher. For example the approximate tariff at night to Palma city or El Arenal is €19-20. However when you get to the destination the taxi meter shows €16 (where normally you expect to pay that amount), but then a driver clicks some button and 'suplementos' fee of around €5-6 is added and the taxi meter immediately shows €22-25 in total. Is it a standard practice? What is 'suplementos' taxi fee exactly (showed below in red, but not much visible)? In other words how does it work (is it a fixed fee, or taxi driver can charge how much he wants)? If so, how to avoid overcharge? Especially in the scenario where there is no any traffic, no waiting time and around 10-15 min simple drive for 9-10km. €4 for trips to/from Banyalbufar, Estellens, Deia (by Soller), Cala Deia, Sa Marina de Valldemossa, or Escorca. Different fares are also used for at night and on weekends, and for trips outside of the Palma municipal area. The airport website shows almost the same supplements, with a slight discrepancy on the baggage charge: €2.90 for trips to/from the airport and €0.60 per suitcase. 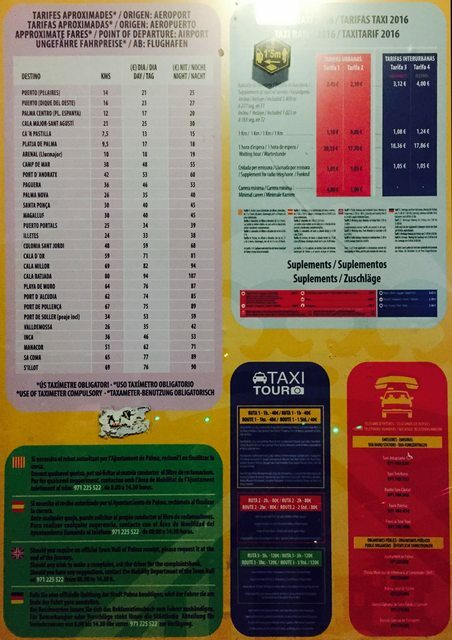 In many cities in Spain the 'suplementos' fee is what a taxi charges for driving you from the airport or to the airport (and some other places where there's organized parking for taxis, such as some train stations). The amount should be written somewhere on one of those stickers in taxi, but you can just ask the driver about it. This is typically a fixed fee, but it might vary between taxi companies (it is rare though). Thus you cannot avoid it if you take taxi from or to the airport. However you can walk outside the airport property (typically behind the parking toll gate), and catch a taxi there, if it is possible. Not the answer you're looking for? Browse other questions tagged spain taxis fees-and-charges balearic-islands or ask your own question. Is there a SIM card that works in Spain, France, and Italy? Is it possible to avoid Wizz Air's administration fee?